An Apple patent published on Tuesday shows continued work into so-called "gaze detection" technology, particularly as a means to control certain user interface events like autocorrect pop-ups, app notifications and more. 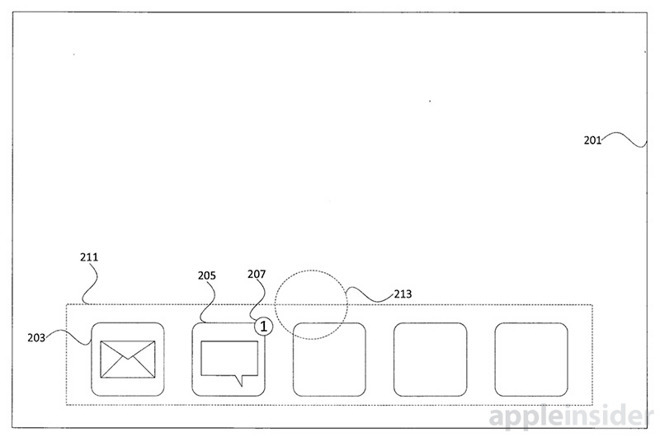 As granted by the U.S. Patent and Trademark Office, Apple's U.S. Patent No. 9,189,064 for "Delay of display event based on user gaze" describes a UI input method that relies on eye tracking technology to manage expiration and execution of time-sensitive display events. A built-in autocorrect utility, for example, might detect and replace misspelled words without user intervention. When iOS or OS X recognizes a misspelling, an autocorrect algorithm generates a display event and throws up a pop-up containing what it believes to be the correctly spelled word. Users can dismiss autocorrect by tapping or clicking on the correction box, but as Apple notes, they might be looking at their keyboard or another window, causing them to miss the notification altogether. A more intuitive system would delay execution of a display event until a gaze tracking device indicates the user is looking at the appropriate screen region, in this case a text autocorrect bubble. In some embodiments, a gaze detection device, such as a camera configured to detect absorbed infrared light, tracks the position of a user's eyes. A probable gaze region can be estimated and applied to coordinates on a display, with a software backend constantly checking overlap with target UI elements. Applied to Apple's example, the text "quicj" would trigger an autocorrect display event containing the corrected word "quick." However, unlike current iOS and OS X iterations, the autocorrect replacement indicator would remain unexecuted until a user's gaze is determined to have overlapped with target text box. This process ensures the user saw the corrected "quick" text and took appropriate actions for its insertion or dismissal. Apple points out that gaze detection can be used for other events, such as app notification badges, pop-up windows and even screen dimming. Perhaps not a replacement for physical touchscreen gestures, gaze detection technology could aid in the navigation of increasingly complex UIs. The future of today's patent is unclear, though Apple has shown an interest in gaze detection technology for both iOS and Mac devices. Certain inventions cover UI augmentations, while others describe advanced display systems with pixel-level pointer control. Apple's latest gaze detection patent was first filed in September 2012 and credits Imran Chaudhri and Stephen O. Lemay as its inventors.